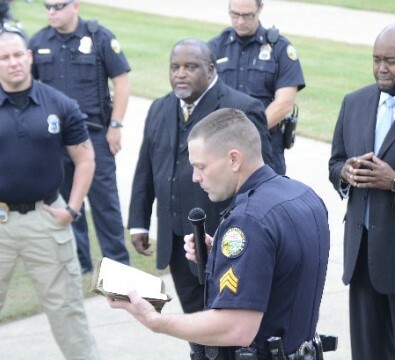 Briefing: We in law enforcement can be real hypocrites sometimes. I spent years working midnights hunting drunk drivers. The guys I worked with were great at finding drunk drivers, writing good reports and even better at testifying in court. The reason some of them were so good was because of their own off-duty experience with drinking and driving. Dispatch (Assignment): Read Matthew 18:15-35. On the Street: Jesus continues the thought of us looking out for our brothers and sisters. Not only are we supposed to set an example in our lifestyle but call others out when they mess up. I have a couple of officers at work who are really good at calling me out when my actions don't match up to my words, or when I'm being a hypocrite. As a Christian police officer, I know that non-Christian officers watch me at times to see if my actions mirror my words. There are times when I want to let my emotions get the best of me and yell and scream at people I come into contact with while doing my job. It is not easy and some days are better than others. Brennan Manning says it better than I ever could. "The greatest single cause of atheism in the world today is Christians who acknowledge Jesus with their lips, then walk out the door and deny Him by their lifestyle. That is what an unbelieving world simply finds unbelievable." Another favorite quote or saying of mine is one my wife tells me, "Your character is who you are and what you do when you think no one is looking". Highlights from this Read: In the last couple of chapters, Jesus has been teaching us how to avoid offending others. Now He shares with us how to act when others offend us. He tells us that our goal is to win them back, not to argue and prove that we are right and they are wrong. This take patience, love, self-control (fruits of the spirit), tact and prayer. Verse sixteen is not about who is right or wrong, it is about restoring and reconciliation. The passage goes on to talk about binding things on earth. Jesus is talking about us sinning and the church being responsible for the discipline. This is why people were so afraid of the early churches. In verse nineteen, Jesus refers to His Father in heaven (see Ecclesiastes 4:9-12). In verse twenty-two, Jesus is trying to convey that they should keep no record of wrongs as in 1 Corinthians 13:5. Investigational Resources: Watch the movie, "Beware of Christians". Officer Safety Principle: We have to be very careful that the person we portray ourselves to be is the person we really are. We need to be like Christ.